A happy return to my search for the best burger in London (criteria and list of venues here – I currently have 16 places on my list *hello elasticated jeans*). I used to think GBK wasn’t that great, especially after an unfortunate incident involving a hideous hangover and an incredibly gloopy and garlicky garlic mayo burger which almost ended in tears. 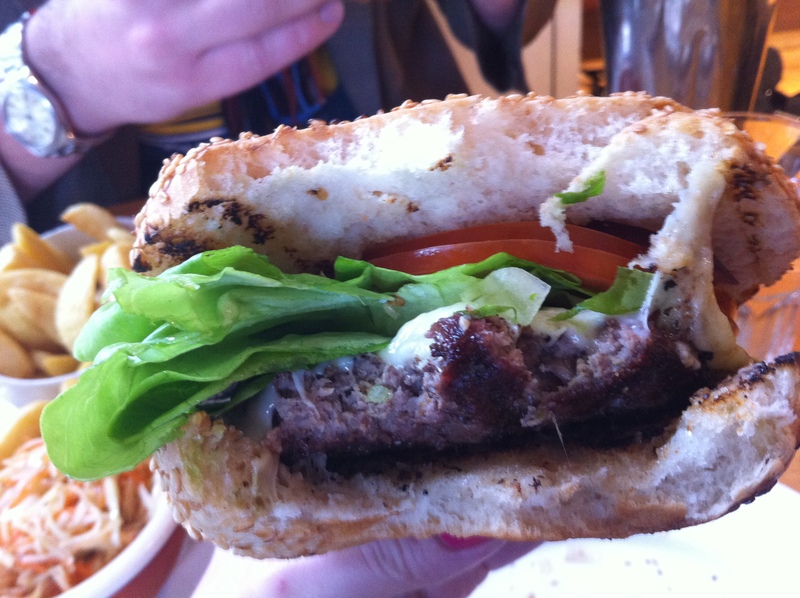 I first tried the Northcote Road GBK when I had just moved to London in 2003. Everyone was excited by it – it was certainly my first experience of a “designer burger” – beetroot! and pineapple! on a burger! – and I liked it, but personally I found the burgers (like at Grand Union) far too big to hold in my hands and eat without getting most of it down my chin. And however designer a burger is, it should still be held and eaten in your hands – there is no way I want to use a knife and fork. I also care not for creole sauce or French cheese or irrelevant vegetables on my burger – I like it simple – big patty, cheddar cheese, relish, tomato, lettace. I was pleasantly surprised this time. I ordered the cheese burger as per the HPL criteria and I’m guessing the onslaught of London burger chains – most noteably Byron but also Ultimate Burger and Grand Union – have made GBK up their game. I could hold it fine and it was really nice. The burger could have been bigger and juicier, and the bun was a bit over-toasted, but it was really tasty and juicy and I enjoyed it. Or maybe I just haven’t had a burger in a while and it was a lovely welcome back to the fold. Either way, it was better than I expected. And the chips were nice and the blue cheese sauce amaaaazing. But the coleslaw was rubbish – more mayo in it please. I realise my life has been missing burgers for way too long so I’m right back on this burger search with abandon. Next up just has to be Byron. This entry was posted in 2. 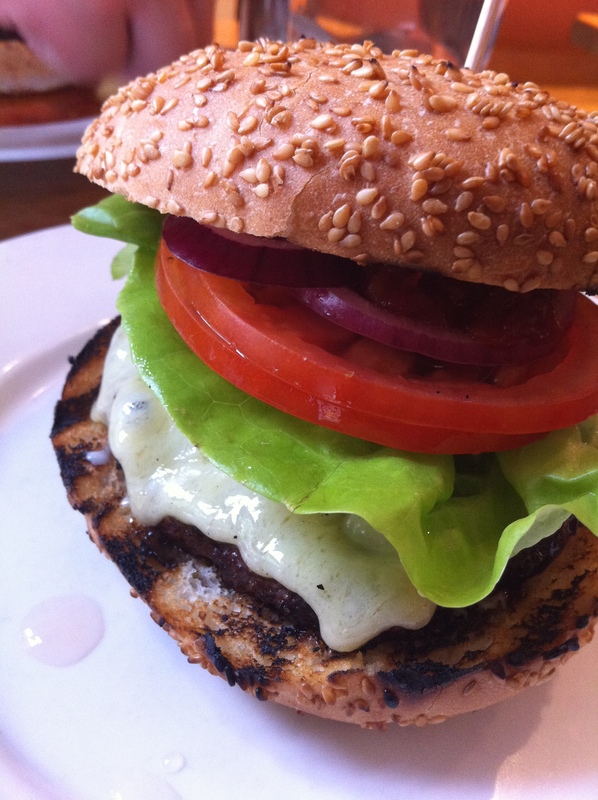 CONNECT - Bars, restaurants, pubs, supper clubs, coffee shops, Best burgers in London and tagged best burger in London, Gourmet Burger Kitchen. Bookmark the permalink. My last outing at a GBK was in Chiswick and it made me vow never to return to one of their shops again, it was pretty awful experience. Byron still the best for me. Next time you’re in GBK do try the Habanero burger (ask for the habanero sauce on the side though). Excited to check your review for Byron – i’ve never left Byron disappointed!